Don’t forget, we are also an Authorised DJI Retailer, and stock the full DJI range. Buy a drone from us, and get a free one-hour one-to-one drone flying lesson worth £120. Reserve your place on one of our drone holidays and come to one of our workshops (Normal Cost £150) absolutely FREE. Reserve your place on one of our PfCO Courses and get a two-hour one-to-one drone flying lesson (Normal Cost £200) absolutely FREE. Protect Your Investment, Learn to Fly with the Experts. Get More Out of Your Flying. We hope to see you at the Photography Show this weekend. It’s at the NEC, and we are on Stand K131. We have some very special offers for people visiting us at the Show. Then we thought, that’s great for all the new people we expect to meet at the Show. But what about our loyal customers who can’t get there. Shouldn’t you get the same great Offers? Of course you should! So, even if you are not able to attend The Photography Show we are offering the following discounts to everyone between 16th – 19th March 2019. FREE Workshop worth £150 when you book a drone flying holiday! Reserve your place on one of our drone flying & photography holidays and choose to attend one of our many workshops for free. For more information on our 2019 holiday programme click here. We’ll send you a Code to claim your free Workshop as soon as you reserve a place on one of our holidays. £300 deposit is all we require to reserve your place. FREE 2 hour lesson worth £200 when you book your PfCO course! Get your PfCO with the UKs longest established and most popular Practical Drone Training Organisation. 3 day Course, every month in Chester and Maidstone for more information click here. We’ll send you a Code to claim your free Lesson worth £200 as soon as you reserve a place on one of our PfCO Courses. £300 deposit is all we require to reserve your place. Protect Your Investment, Learn to Fly with the Experts. Get More Out of Your Flying. For more information or to book a Lesson click here. The rules have now changed in France. The drone must be labelled so that its registration number can be read with the naked eye from 30cm. You will receive an email confirmation for each drone registered, with a Certificate of Registration attached. Affix a suitable (“Dymo” or similar) label to your drone showing its registration number. Finally, be sure that you have appropriate PL Insurance in place. Membership of the British Model Flying Association (bmfa.org) @ £38 per annum gives you £25M worldwide PL cover, although you may already be covered by your existing insurance… You must check, as this is your legal responsibility. On 20/02/19, the UK Government announced new amendments to The Air Navigation Order 2016. Here we explain the important changes that you need to know about. 1. It remains illegal to fly a drone of any mass within an aerodrome flight restriction zone without permission. Aerodromes can take the form of airports, military airfields, or smaller aviation airfields. You can find a list of the UK’s aerodromes here. Aerodromes have a ‘flight restriction zone’ around them to ensure the safety of aircraft. They are active at all times, and apply to drones of any mass. 2. With effect from 13/03/19, the flight restriction zone around airports and airfields will change. The previous 1 km restriction from an airfield boundary will be replaced by the airfield’s existing Aerodrome Traffic Zone, and Runway Protection Zone. Together, these two zones make up the new flight restriction zone. You must not fly your drone within this zone unless you have permission. a) Aerodrome Traffic Zone (ATZ): This is the red circle in the image below. Its epicentre is the midpoint of the longest runway, and has a radius of either 2 or 2.5 nautical miles depending on the length of the runway. 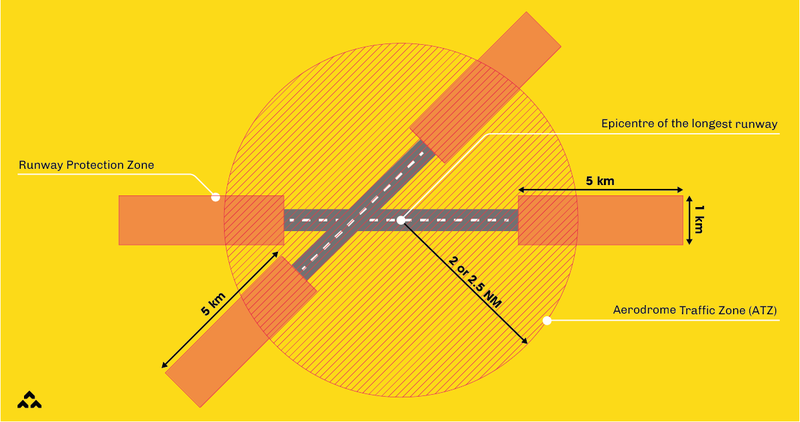 b) Runway Protection Zone: This zone starts from the end of each of the airfield’s runways, extending five kilometres by one kilometre zones*. It’s marked as the red rectangle in the image below. Both zones extend upwards to a height of 2,000 feet above the airfield. To view a map which illustrates the flight restriction zones of individual airfield’s in the UK, visit the Drone Safe website. An illustration of the new flight restriction zone around aerodromes, which will come into force on 13/03/19. *At Heathrow airport, each runway protection zone is 1.5 km wide. 3. If you want to fly your drone within a flight restriction zone, you must have permission from either air traffic control, or the airport itself. It’s up to air traffic control, or the airport itself, to give you permission to fly within an aerodrome flight restriction zone. You can find the contact details of air traffic control units in the UK here. If you want to fly above 400 ft in a flight restriction zone, you need to get permission from the relevant air traffic control, as opposed to the CAA. PhantomFlightSchool are the experts in drone holidays. Now in our fourth year, we are delighted to have received only 5***** reviews from everyone who has come on a drone holiday with us. More than 75% of clients have repeat booked. In 2018 we ran six sold-out drone holidays to Spain, to the French Pyrenees, and to Corfu. In 2019, we are retunring to all our favourite places, and adding holidays to the Monasteries of Meteora in Greece, and in the UK we have Drone Photography and Videography Masterclasses in the Lake District, the Yorkshire Dales and on the Dorset Coast. Coming on a drone flying holiday with us gives you the opportunity to fly with like-minded drone enthusiasts, in places few people could find or would feel comfortable flying on their own. We have meticulously researched every destination, and every flying location, established good relations with the local authorities, and found the best places to visit, to sleep, and to eat. In Spain, we fly over enormous landscapes, steep valleys, clifftops overlooking the sea, and stunning cobalt blue lakes. In France, we up the ante somewhat, with stunning mountain locations and ruined castles offering more challenging but very rewarding photo opportunities. Corfu presents a totally different palette of marine locations. This one is for the experts, as we will be flying every day from the back of a chartered 48ft luxury yacht. Hand launching and hand catching required. While Greece is pretty much a byword for amazing spectacles! In the UK, we’ve teamed up with two Award Winning Photographers, to really help you improve your drone photography and videography. And you are always flying under the expert gaze of one of our hugely experienced PfCO qualified drone pilots, who is there to support and guide you every time you take off. Flying and filming together, comparing flight plans, camera settings, and shooting angles and directions, everyone learns from each other. Whatever your standard when you join one of our trips, you will go home with knowledge and expertise that will enhance all of your future drone flying and filming. Join us for the trip of a lifetime in 2019! For more information on any of our drone flying holidays call us on 01244 893 872 or send us a message. After careful consideration this client chose PhantomFlightSchool to supply their shiny new DJI M600 drone. They chose PFS because of the full package we offer when we sell a drone like this one: support with the build; full training; and a half-day of practical flying included in the price. The “big beast” of the DJI line-up weighs well over 7kgs, and is capable of lifting a 3kg payload. This drone was chosen by the client because it has rotor / motor / propeller redundancy, as well as battery redundancy, which was considered essential for a long-term project filming and recording development on a tall skyscraper construction site in a congested area. Here is brief clip of the M600’s maiden flight, at our Maidstone, Kent, Flying Location this weekend.